According to every impartial fan inside Toyota Center in Houston and watching at home on pay-per-view, UFC president Dana White, and most importantly, the three judges sitting Octagon-side who were paid to score Saturday’s bout, Daniel Cormier took it to Roy Nelson (pictured) at UFC 166. However, Nelson didn’t happen to see it that way. Speaking of being frustrated, White appears to be at wits end with Nelson. In fact, if White had a single hair left on his bald dome to pull out, Nelson would have forced him to do it years ago. It’s no secret White and Nelson aren’t BFFs. White was even trashing “Big Country” just two days before his showdown with Cormier. While White appreciates what Nelson brings to the table, he claims there’s a clear reason why the popular heavyweight has never competed for the belt. 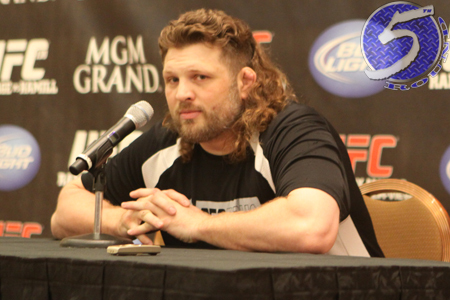 “Contrary to popular belief, I try so hard to like Roy Nelson,” White stated. “The guy says the dumbest s*** I’ve ever heard in my life, and he’s very delusional. “That being said, I think he’s an incredibly tough guy. With his physique and everything, I’m blown away how he can compete at this level and how talented he is and what a great chin he has. But every time he gets above No. 5, he looks like he doesn’t belong in the top 10.